Welcome to The Bigwood Event Center, Central Minnesota’s premiere meeting and event facility! The Bigwood Event Center is located in beautiful Fergus Falls – right off Interstate 94 and Highway 210. We are conveniently positioned only three hours northwest of the Twin Cities and less than an hour from Fargo/Moorhead. The Bigwood Event Center offers over 12,000 square feet of flexible meeting and banquet space to accommodate groups of any size. Our beautiful and functional ballroom is perfect for groups up to 600 people. Smaller groups and breakout sessions can be accommodated in the Oxley or Ferber Rooms. The Fergus Boardroom provides the ultimate environment for getting together - from high profile meetings to private events. Our boardroom features executive seating for 16 people and is fully equipped with teleconferencing capabilities, LCD projection screen, and full-wall white board. Our bright and spacious Pre-Function Area provides ample room for socializing, registration, exhibitors, and more. Let our experienced and professional catering staff provide a wide variety of food and beverage options for your next event. Whether it is a meeting, conference, convention, tradeshow, wedding reception, banquet, reunion, family gathering or social event, our welcoming hospitality staff and accommodations will ensure the success of your event! The Bigwood Event Center is conveniently connected to the The Falls Inn & Suites, featuring 96 hotel rooms and suites. Hotel accommodations feature complimentary high speed wireless internet, a deluxe full breakfast buffet each morning, microwaves and refrigerators. For a fun experience, be sure to select a room with a private balcony overlooking the tropical Minnesota shaped pool and lounge area. 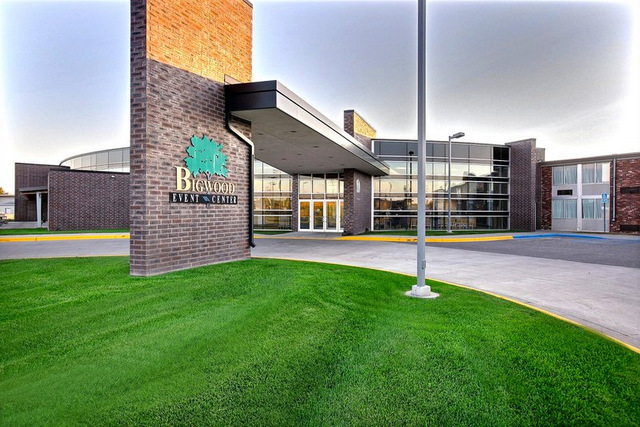 With the largest indoor pool in Fergus Falls, not to mention our whirlpool, newly-remodeled fitness center, and on-site Z103 Bar & Grill, your next meeting or reception will fit right in at the Bigwood Event Center & Hotel. Call us directly at 218-739-2211 for more information and reservations. We know that it is important for your guests to enjoy what little free time they have. Let us help keep your attendees entertained and comfortable while enjoying their time in Fergus Falls. Spend some time trying your hand in a poker tournament or take in some live music at our on-site restaurant. The Z103 Bar & Grill is on hand for your dining needs. Our menu is cleverly designed and features a broad variety of food ranging from appetizers and pizza to our signature steak and walleye dinners. Our Spectacular Sunday Brunch is a local favorite and offers classics like chef-carved prime rib and made-to-order omelets. The Z103 offers casual dining along with occasional live entertainment, pool tables, large screen TV’s, darts, foosball and video games for your entertainment. Check out the website at www.z103barandgrill.com for more information and to view the entertainment calendar.